Soul of Somanya buys Krobo beads at full retail prices for use in the products we offer, and also for resale in the global marketplace. In addition to boosting local sales, this helps us to provide the Soul of Somanya jewelry artisans with a dependable living wage while simultaneously increasing the demand for, and the visibility of, these beautiful little works of art. 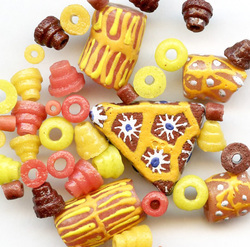 To date, we have shipped Krobo beads to some 46 countries worldwide. We adhere strictly to fair trade principles. All proceeds from the sale of the beads we offer go directly into the Soul of Somanya coffers so that we can keep offering to Krobo youth the dignity that comes from honest work. 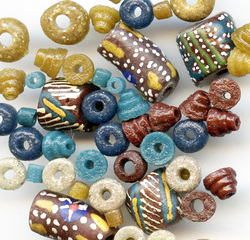 Particular bead designs are not always available in Kroboland on a given day, or even in a given month. A beadmaker may produce a single batch of beads in a certain design and then never repeat it again. 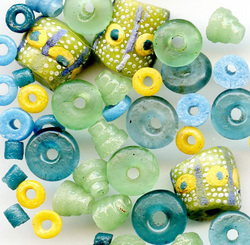 Consequently, we may not always be able to supply particular beads you have seen on our website in the past. That said, please feel free to ask. Bernard is always happy to keep an eye out for what you need!